Adding Pictures as attachments is a common process and is usually pretty straightforward. 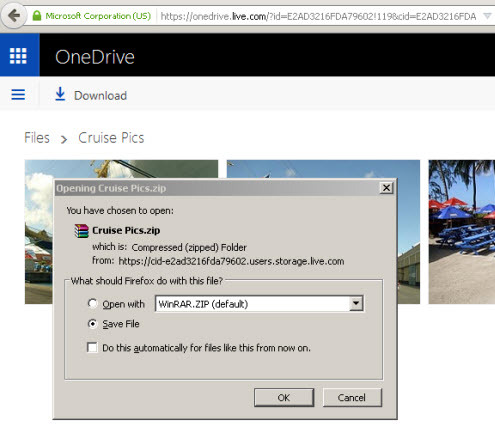 However because of the way Windows live mail integrates with Onedrive adding a picture attachment to an email in Windows live mail isn’t as simple as it first appears . OneDrive is a personal cloud storage service from Microsoft that enables you to store, synchronize and access files across the Internet and on multiple devices. 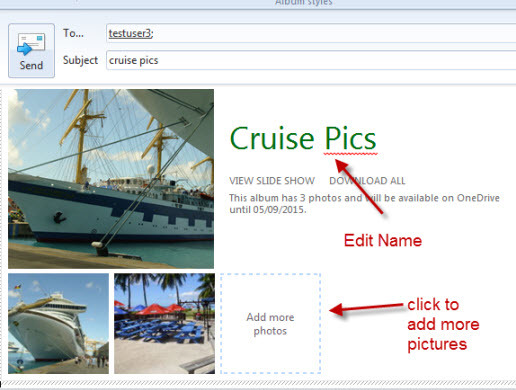 In Most email clients when you want to send a picture attachment it is sent as part of the email message. However due to the integration between Onedrive and Windows live mail this is not the default behaviour when you try to send a picture using Windows live mail. Click on the email message icon (top left) or enter CTRL+N to create a new message. 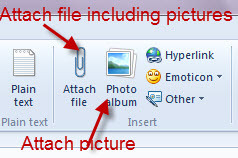 Click on the attachment icon (paperclip) and not the photo album. 1. If you click on the photo album to add the picture then you will need to have an outlook.com/hotmail.com account. If you don’t have one then you have to use the paperclip icon to add the picture. 2. You are subject to attachment size limits (usually around 20MB) when using this method. If you have an outlook.com or hotmail.com account you can send your pictures using Onedrive. If you use this method then you are not subject to the email attachment limits as the pictures aren’t sent with the email. What is sent is a link to the pictures. The pictures are copied from your PC and are stored on your Onedrive account. 1. Click on the email message icon (top left) or enter CTRL+N to create a new message. 2. 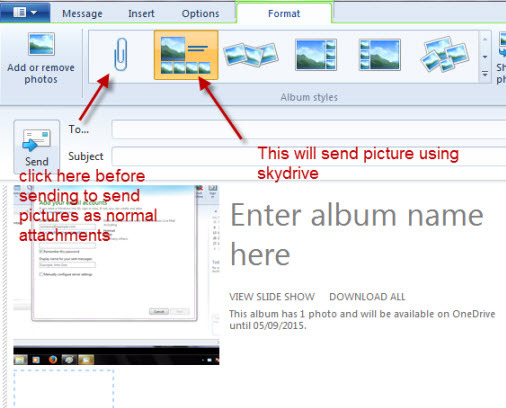 If you click on the Photo album icon next to the paperclip then Windows live mail will try to use Onedrive. If you are already logged into your onedrive account then this will happen transparently. If you aren’t logged into a Windows account e.g. hotmail/outlook.com then you will be prompted to login. 3. Add the images and select the style for you photo album. 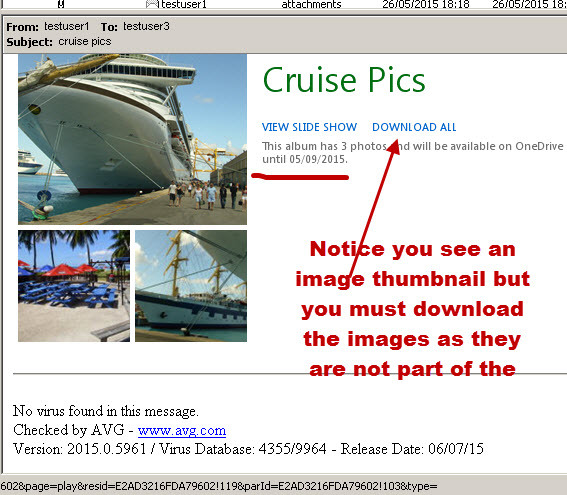 If you send the email attachment using Onedrive then the recipient sees thumbnails of the images, and the option to download the images from Onedrive. The images are only stored on Onedrive for a certain period of time after which they are inaccessible. If you click on the download all link you are taken to Onedrive. Q- My Windows live Mail is configured to use Yahoo email to send and receive email will it still try to use Onedrive to send pictures? A- Yes it will. It doesn’t matter which email account you are using or which account is the default account. Q –How do I bye pass or disable Onedrive when sending attachments in Windows Live Mail 2011? Q- Can I send other attachments e.g, large files (not pictures) using Onedrive? A- Yes but you will need to get the links manually. Q- If I use Onedrive to send my pictures does the recipient need a Ondrive account to see the pictures?